Currently, the United Nations is drafting an Arms Trade Treaty to impose strict controls on firearms and other weapons. 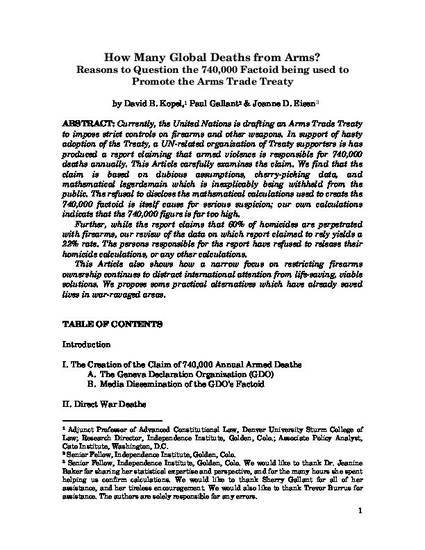 In support of hasty adoption of the Treaty, a UN-related organization of Treaty supporters is has produced a report claiming that armed violence is responsible for 740,000 deaths annually. This Article carefully examines the claim. We find that the claim is based on dubious assumptions, cherry-picking data, and mathematical legerdemain which is inexplicably being withheld from the public. The refusal to disclose the mathematical calculations used to create the 740,000 factoid is itself cause for serious suspicion; our own calculations indicate that the 740,000 figure is far too high. Further, while the report claims that 60% of homicides are perpetrated with firearms, our review of the data on which report claimed to rely yields a 22% rate. The persons responsible for the report have refused to release their homicide calculations, or any other calculations. This Article also shows how a narrow focus on restricting firearms ownership continues to distract international attention from life-saving, viable solutions. We propose some practical alternatives which have already saved lives in war-ravaged areas.